Organic Sales: Overall store sales are more than 75% organic. Produce sales are 95% organic. Non-organic produce from local farmers must use organic production practices. The store contacts manufacturers who claim that their products are GMO-free, but do not have Non-GMO Project verification. Strong relationships have been built with brokers, reps and manufacturers to make sure that GMO products do not enter their store. The store sources many local bodycare product providers whose products are GMO-free. Supplements containing suspect GMO ingredients are discontinued. Store buyers are finding that Non GMO verified products are in ever higher demand. 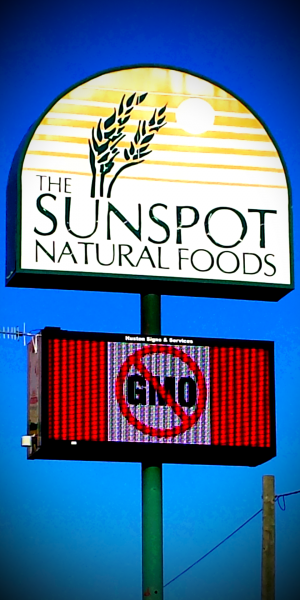 Sunspot Natural Market did an store audit four years ago and removed any products found to contain GMOs. Supplements containing suspect GMO ingredients are discontinued. Store staff continually monitor potential GMO ingredients by department to make sure suspect products are not stocked by the store. Thousands of homemade shelf talkers pointing out Non-GMO Project verified products are on display throughout the store. 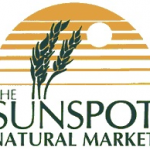 The Sunspot Natural Market s a Non-GMO Project Participating Retailer. When Joan Johnson founded Sunspot Natural Market in Kikomo, Ind., 36 years ago, GMOs and social media weren’t part of anyone’s vocabulary. Today, Joan and her team have mastered the art of using Sunspot’s facebook page as a social media bully pulpit for the anti-GMO movement. Posts like “Remember our battle cry: Just say “NO!” to GMO!” remind consumers that they have a choice. Updates on GMO labeling initiatives, the Monsanto Protection Act and Marches against Monsanto, interspersed with articles and videos, remind folks of Joan’s tenaciousness when it comes to educating her customers and suppliers. Joan’s anti-GMO campaign—which earned Sunspot a place on the Organic Consumers Association’s Top 12 Right to Know Grocers list —was born five years ago, when she couldn’t find GMO-free bulk soy lecithin. Soon after, the store’s suppliers learned that the words “battle cry” were no exaggeration when it comes to Joan’s determination to rid her stores’ shelves of products containing GMOs. Sunspot buyers read labels, check incoming deliveries and contact manufacturers when they suspect a product may contain GMOs. When they attend trade shows, they grill manufacturers about the GMO ingredients in their products, and drop those that aren’t able to come clean. They even pressure local livestock producers to discontinue using GMO feed. Along with being passionate about GMOs, Joan is also clearly passionate about getting to know her customers, educating them about a wide variety of food and health issues and providing a healthy community gathering place. Sunspot provides customers with plenty of in-store information, including Non-GMO Project materials, house-made “What are GMO’s?” leaflets and GMO-free signage under popular products, like corn chips. The store has executed its mission—to help our customers make better decisions about their health and well-being, while providing the finest quality food and supplements available—so well over the years, that 10 years ago, Sunspot opened a second location, in West Lafayette, Ind. The West Lafayette store’s “Food for Thought” speaker series recently featured presentations on the power of fermented foods, “Farm to Fork, Understanding the True Benefits of Local, Fresh Foods” and a native plants presentation. The Kokomo store’s “Table Talk” series has included talks on factory farms, a presentation about a customer’s recent trip to Cuba to study the country’s sustainable agriculture initiatives, and “GMOs, Friend or Foe”, a table talk by Dr. Kent Blacklidge, a GMO expert from Purdue University. A: It was about 5 years ago when I became concerned that I could not find bulk soy lecithin anymore. Then I found out there was already a problem of getting non-GMO soy at a decent price. A. We quickly realized that we had much work to do when even our savviest customers did not know what GMO stood for, let alone why they would want non-GMO! So, one on one, we began the conversation. I also talked with each buyer for The Sunspot and made sure to ask about purity before bringing in any new products. We would love to be a completely GMO-free store someday! A. When calling manufacturers for details on sources of ingredients many times we get the “we are not sure but will get back with you” or “we are working on that” which is not an answer! Even worse is when the person on the phone says “we are supposed to tell you it’s gluten-free.” That’s when I know they have no clue what I’m even asking. A. It’s a big problem, but we are interviewing each supplier. I was devastated when I found out that alfalfa, which is such a powerhouse of nutrition, was cleared for genetic modification. We had to educate our local egg suppliers when we found that even though the chickens were pastured, they were still being fed GMO grain during the winter months. A. 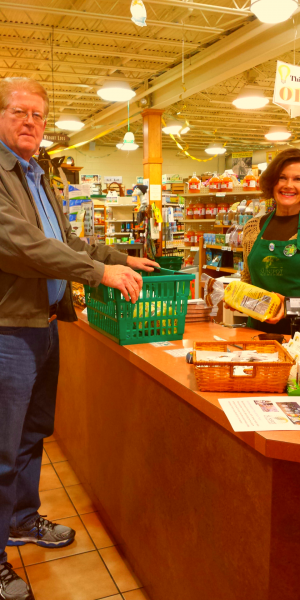 The local egg farmers did change over to non-GMO feed when we educated them about the feed they were buying. Also I remember about 3 or 4 years ago at a trade show, we asked the folks at the Kashi booth when they were going to stop using GMOs in their products. They did not even know what we were talking about and then tried to deny it. We told them we were removing all their products from our shelves until they came clean about it. Now the Kashi brand, owned by Kellogg’s, does seem to be making an effort with its certified organic offerings. A. Our customers are becoming more aware, and really appreciate our signage, handouts and educational seminars with expert speakers such as Dr. Kent Blacklidge from Purdue University. Our Facebook page is loaded with appreciation from customers! Q: What tools could OCA or the natural foods industry provide that would help you and other grocers keep GMOs out of the food supply? A. A power point presentation that we could all show in our stores. A comprehensive list of all the products that are in your wonderful app “Buycott” because not everyone has a smart phone. A. It takes a lot of effort, but it is worth it! I’d also tell them that we all vote with our dollars and then our forks. We need to tell manufacturers we will discontinue their products until they remove the GMO ingredients. We need to make phone calls every day, send emails, post on facebook, and let our elected officials know how we want them to vote! Attend rallies, join garden clubs and talk to farmers! A. Ever since I opened in November of 1977, I vowed to listen to each customer and treat them as I would like to be treated. After 36 years, we have become a trusted source for pure choices in the communities that we serve. We know so many of our customers by name, and if we don’t, we make it a point to introduce them to “the family.” Our customers have learned that we truly care about them and are not just trying to sell them something. Listening is huge! A. It’s pretty simple, to provide pure products to our customers and help educate them, too! We learn and grow together every day. A. When possible, we check ingredients before ordering, and again “at the gate” when processing in the store. If something does come in with questionable or unacceptable ingredients, we make phone calls to find out about it, and if we find it unacceptable, we send it right back with the reason why. A. To make available pure products for our customers’ health and happiness in a fun, educational, uplifting environment! Your email blasts are fantastic, so keep that up! Also as I mentioned before, a power point or a DVD would help for in-store presentations. A. The people and the love they carry! The herbs and foods and the people that grow and produce the herbs and foods! Watching families grow up over the years continues to be such a reward and blessing. Really being part of our communities gives me that feeling of connectedness to others that I know is so helpful to my own health and happiness! A. “In high school, when my grandmother died, I inherited her herbal (a book containing the names and descriptions of plants)—she had pressed actual plants between the pages in their respective chapters. I knew what I wanted to do right then, offer herbal remedies to folks because I do believe that we have evolved with plants since the beginning. I took a correspondence course out of Canada, which was the only school available to me at the time, then opened up The Sunspot and wondered if anyone would show up! They did, and my very first customer, Vern McDonald, still shops here today! I continue to love learning about plants and their relation to human health and happiness. A. The Sunspot hopefully lives up to it’s name: A sunny, hopeful, happy place or even scientifically: a storm on the sun that mixes things up a little! I am eternally grateful to be here to serve our communities. Our customers, co-workers and vendors are the cream of the crop of humanity, and after 36 years, I still feel like I have not worked a day in my life! Anyone reading this, if you are visiting Kokomo or West Lafayette, come in and we will give you a free store tour and a free cup of organic non-GMO tea. And we’ll get to know each other. Sunspot is a great store. I live near W. LAFAYETTE. I am happy to know these insights about the owner and her fight particularly against Monsanto. I taught special needs, later, after feeling that we are what we eat, I learned from Dr. Don Huber Prof. Emeritus retired, whose area of plant pathology pretty much proved all the bad effects on humans due to GMO foods. I asked Dr. HUBER IF THIS WAS CAUSING AUTISM because I saw that autism covered every socio-economic group. He said yes. He also explained it down to the cellular level. I know Dr. Huber is right..As all things that make those with no social consciousness super wealthy, it is a FOOD ALTERATION THAT SHOULD BE ILLEGAL. The European Union forbids U.S. companies to sell GMO foods in their countries. They have very very few cases of autism in their countries. In the U.S. by 2020 half of children born will be somewhere on the autism spectrum. OUR CHILDREN DESERVE SAFE FOOD AND SO DO FETUSES. I am burning mad at greedy Owners and stock holders of Monsanto. Most of them are coincidentally republicans! PLEASE come to PA! :) Kudos to you! I hope your store and its philosophy inspire many copy-cats. GM phude is an attack on American’s health. Would love to open a store like this in South Florida! I’m originally from Kokomo, IN and had no idea that you were there. I am so impressed, and I will tell my family and friends back home about your store! This is an example we need to copy. If we all follow the same path things WILL change . Sunspot is setting a shining example. Keep it up! I tried to share this on facebook, but it didn’t post. Sorry! I don’t live in Indiana, but have relatives and friends who do–in the towns of both stores’ locations. If I ever get over to West Lafayette, IN., I am going to look up Sunspot Natural Market, for sure! THANKS for being there! I love your article. It is very informative. Have you considered opening stores here in the northwest? You would certainly be welcomed with open arms as people would love to shop at a store that “practices what it preaches”. Leaving next week flying into South Bend…wish now after reading about your store I would have flown into Indy and drove up so I could visit your store. It’s OK I come up about 3 times a year to visit my dad. He’s 95 yrs old now but when I was gowing up my dad grew the biggest and nicest home garden anyone could ask for. He grew everything in it and everything in it was organic..nothing like picking a vine riped tomatoe from the plant and eating it like an apple….he had fruit trees too and the fruit was all organic too…those were the days….thank you dad for all the work you put in…can’t wait to see you next week…these 80 degree temps will still be here when I get back so I can suffer a little cold to be with you. Merry Christmas everyone. So wonderful to find you on this list! I am in Wabash and plan to start coming to your store in Kokomo now that I know you are there. Thank you for your work. Congrats to Sunspot! Love your store! It’s a blessing! Congrats to Sunspot!! You have have helped so many!! So happy to have you. God bless!! Keep up the great work!! Sounds like another reason for me to move from Madison County to Kokomo. OMG! Light bulb just went off in my head! I pass up your storefront every time I drive to South Bend and back! I will now stop and SHOP! Thank you for your diligent efforts to maintain non GMO foods and supplements! WAY to go! I live in Ohio, but just told my Ohio-born but Hoosier resident (Warsaw) about you. I’m envious! I’d ask you to open a store near me (Toledo), but our area is pretty clueless, so I don’t know that it would be a very good ROI for you!